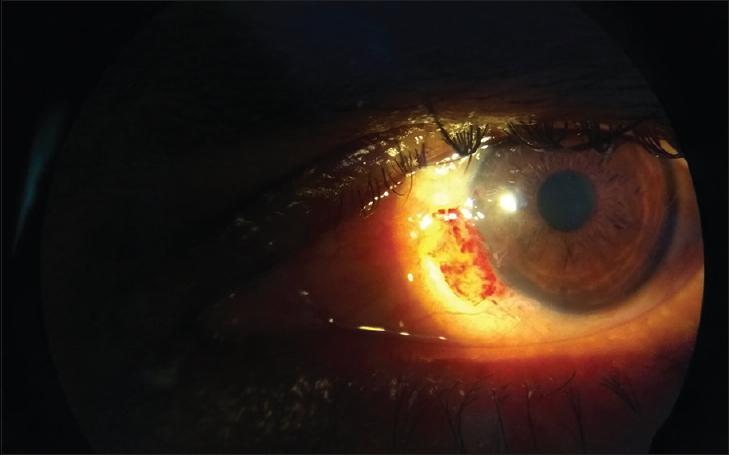 Aim: The aim of this study was to evaluate and analyze the surgical outcome of suture-free, glue-free limbal conjunctival autograft after pterygium excision. Design: This was a prospective, interventional, and hospital-based study. Materials and Methods: Forty eyes of 40 patients with primary pterygium were graded, and excision was performed by the single surgeon. To prevent recurrence-free LCAG was used with special surgical technique “subconjunctival resection of fibrovascular pteygium and cauterization of limbal base to destroy abnormal limbal cells along with resection of 7-mm pteygium.” In this technique, we used patient's own blood as a bioadhesive. The eye was patched for 24 h postoperatively. Patients were treated with topical eye drop prednisolone acetate (1%) 1 drop six times per day with gradual tapering every week, eye drop moxifloxacin (0.5%) 1 drop four times per day, eye drop nepafanac (0.5%) 1 drop four times per day, eye drop carboxymethyl cellulose 1 drop six times per day, and carboxymethyl gel at night for 6 weeks. The outcomes were assessed regarding any recurrence, complication(s), and operative time at each follow-up visit on day 1, day 7, day 30, 3 months, 6 months, and 1 year. Results: There were 30 males (75%) and 10 females (25%). 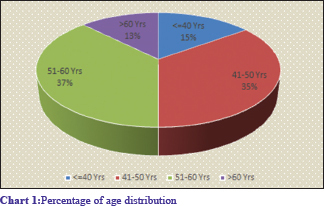 The mean age of all the patients was −51.15 (51.15 ± 10.3 years), range 51–60 years. 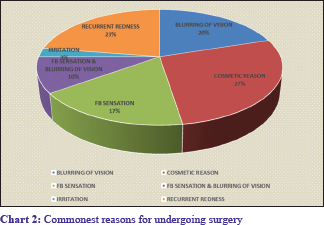 Cosmetic reason was the chief indication of surgery (11 eyes, 27.5%), followed by recurrent redness (nine eyes, 22.5%). 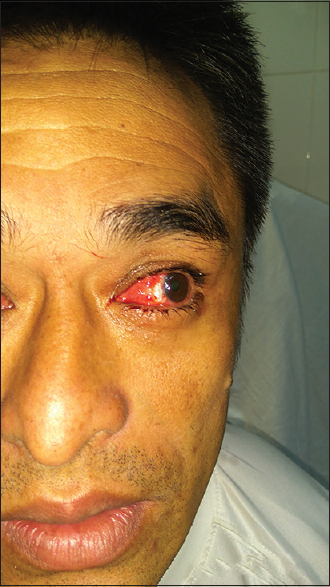 There was no recurrence, and the most common complication was hemorrhagic graft (18 eyes, 45%). All grafts appear indistinguishable by 3 months and were free of symptoms. Average surgical time was 18 ± 2 min. Conclusion: (1) 8-mm LCAG with subconjunctival resection of fibrovascular pteygium and cauterization of limbal base to destroy abnormal limbal cells are very affecting in preventing recurrences. (2) Using patient's own blood as bioadhesive is associated with less postoperative discomfort, less postoperative time, and less complications. 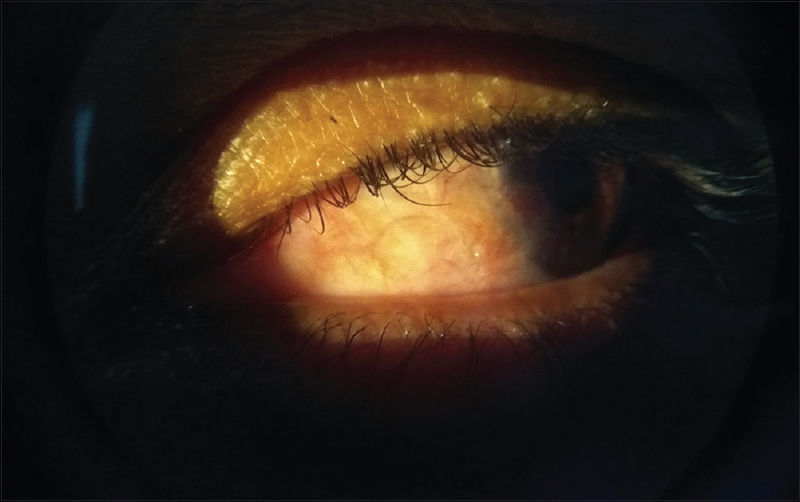 Ultraviolet rays induced elastotic degeneration of subepithelial connective tissue plays role in pathogenesis of pterygium. Reports suggest vascular endothelial growth factor is highly expressed in new vessels in pterygium tissue compared to normal conjunctiva (Marcovich, Morad et al. 2002) and play a role in pterygium (Marcovich, Morad et al. 2002; Aspiotis, Tsanou et al. 2007). Diminution of vision in progressive pterygium is mainly due to flattening of horizontal meridian of cornea, giving rise to “with the rule astigmatism.” As a result of tissue fibrosis, it may lead to alteration of corneal curvature leading to astigmatism and corneal opacity. Cosmetic disfigurement, recurrent inflammation, visual impairment, and difficult to wear contact lens are the main indications of surgery. The results of pterygium surgery are often compromised by postoperative recurrence, which is the leading cause of surgical failure in a significant number of cases. Surgical removal is still the main treatment available for pterygium. The recurrence rate after pterygium surgery may vary according to type of surgery done. Bare sclera technique is associated with recurrence rates around 38.9%. Adjuvant measures such as beta-irradiation, 5-fluorouracil, and Mitomycin-C reduces recurrence rates but associated with complications. Conventional surgical procedure(s) practiced nowadays to prevent recurrence, alone or in combination, are conjunctival flap, conjunctival rotational autograft, amniotic membrane graft (AMG), or free conjunctival autograft (CAG) or limbal CAG (LCAG) with surgical adjunct (e.g., suture, commercial fibrin glue, and intraoperative or postoperative 0.02% mitomycin C [MMC]), with variable postoperative recurrence and/or success rate (s). Till recent years, commonly used techniques are CAG, LCAG, and AMG using fibrin glue, sutures, or MMC as adjuvant. However, using these surgical adjuncts have surgical risks and complications too.,, As we all know that cause of pterygium is limbal stem cell deficiency, and it progress as subconjunctival fibrovascular mass; hence, the surgical technique was using limbal CAG of 8 mm to replace the stem cells along with subconjunctival resection of pterygium to prevent slow progress of pterygium even if it start reappearing. Cauterization of limbal base was done to destroy the abnormal limbal stem cells. Following ultraviolet ray exposure there is alteration of limbal stem cells allowing subconjunctival fibrovascular mass to progress and ultimately encroaches up to the cornea. We resects 7 mm along the limbal margin and used 1 mm oversized graft kept in mind the risk for limbal stem cell deficiency at the donor side. 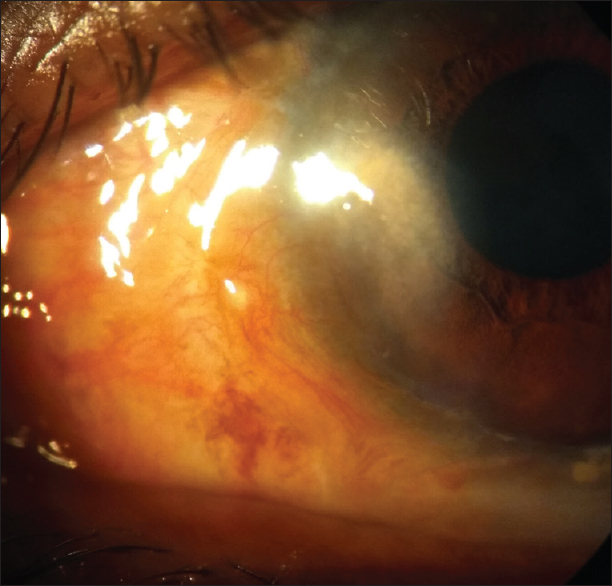 Considering the pathophysiology of pterygium, the aim of this study was to prevent recurrence with this special surgical technique. 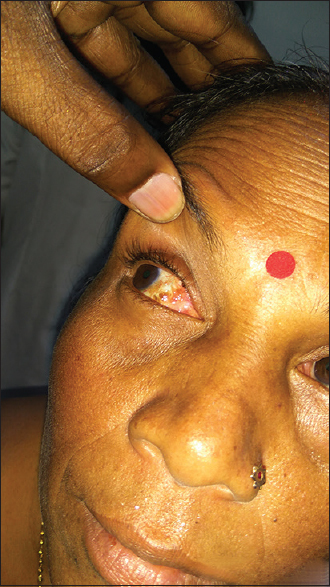 This prospective study comprised 40 eyes of 40 patients undergoing pterygium surgery at our hospital ANIIMS, Port Blair, Andaman and Nicobar Island. Patients included in the study were from 20 to 60 years of age having primary pterygium involving any eye. Eyes with any pathology which would hamper wound healing such as active infection or inflammation, symblepharon, past ocular surgery within the past 6 months, trauma, and systemic diseases such as diabetes mellitus, collagen vascular disease, pregnancy and bleeding disorders, dry eyes, and allergic eye diseases were excluded from the study. Written informed consent was obtained from each patient. Preoperative assessment included refraction and best-corrected visual acuity (BCVA), slit-lamp biomicroscopy, baseline intraocular pressure (IOP)-measurement using Goldmann applanation tonometer, fundus examination, and photographic documentation of the pterygium. Grading of the pterygium was done as, Grade I-pterygium head up to the limbus, Grade II-head between the limbus and a point midway between limbus and pupillary margin, Grade III-head between a point midway between limbus and pupillary margin, and Grade IV-crossing pupillary margin (Dr. Maheswari Sejal, M. D, senior consultant cornea and refractive surgery, shri Ganapati Netralaya, Jalna, India-classification). All the surgeries were done by single surgeon (Dr Sujit Das) using the same technique. Proparacaine and Betadine eye drops were used for 5 min in each case followed by peribulbar anesthesia. After applying speculum and bridle suture, the first neck of the pterygium was cut and cauterization was done along the limbus up to 7 mm to destroy all abnormal limbal cells. Pterygium was then avulsed using 10-0 needle holder and the corneal surface made smooth using a crescent blade. Subconjunctival fibrovascular pterygium was then separated using a conjunctival scissor and cut up to 4 mm from the limbus kept in mind the insertion of medial rectus muscle. In all case, the author inject normal saline using 26-G needle to separate the free conjunctiva from the underlying tenon's capsule. The author reached half mm inside the limbus using the crescent blade [Figure 1] to take limbal cells as much as possible and an 8-mm graft was cut using a conjunctival scissor from the superotemporal quadrant. The free LCAG was then spread over the bare sclera maintaining limbal-to-limbal orientation. The author wait for 5 min for better adherence of the graft. Thereafter, gently removed the speculum and the eye was patched for 24 h using chloramphenicol eye ointment. Any intraoperative complication as well as the operative time was documented. Average surgical time was 18 ± 2 min, range 18–20 min. Next day, the eye was assessed for symptom, graft adherence, or any complication(s) under slit lamp. Postoperatively, all patients were treated with topical eye drop prednisolone acetate (1%) 1 drop six times per day with gradual tapering over 6 weeks. Eye drop moxifloxacin (0.5%) 1 drop four times per day, eye drop nepafanac (0.5%) 1 drop four times per day, eye drop carboxymethyl cellulose 1 drop six times per day, and carboxymethyl gel at night were given for 4 weeks. All patients were followed up to 1 year (at postoperative day 1, 7, 30, 3 months, 6 months, and 1 year). At each postoperative visit, thorough slit-lamp examination, tonometry, and photo documentation were done, and any recurrence, complication(s), or any complaint were recorded. The primary outcome measure was the recurrence and the secondary measures were complication(s) and surgical time. We defined as follows: (1) “recurrence” as the reappearance of fibrovascular growth at the site of previous pterygium excision extending beyond the limbus onto the clear cornea. (2) “Complication” as any adverse event related to the surgery in the intraoperative and postoperative period, the graft itself, or the drugs prescribed. In this study, 40 eyes of 40 patients with primary pterygium underwent excision followed by SFGF LCAG. The mean age of all patients was 51.15 (±10.3 years) [Chart 1]. There were 30 males (75%) and 10 females (25%) with an insignificant difference in mean age (51.07 ± 10.3 years and 51.40 ± 10.3 years, respectively, P = 0.931, t-test), with the highest incidence seen among 51–60 years aged (37.5%) [Table 1]. The most common presentation was cosmetic reason (11 eyes, 27.5%) followed by recurrent inflammation (nine eyes, 22.5%) [Table 2] and [Chart 2]. Grade III pterygium was found to be the most common grade (22 eyes, 55%). Most of the patients were farmers (nine patients, 22.5%) followed by laborers (five patients, 12.5%). 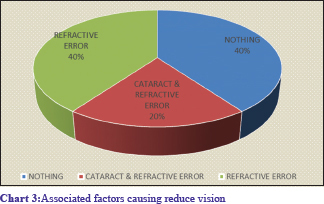 Sixteen of them had no visual complaints (16, 40%), 16 had refractive error (16, 40%), and eight had cataract with refractive error (8,20%) [Table 3] and [Chart 3]. 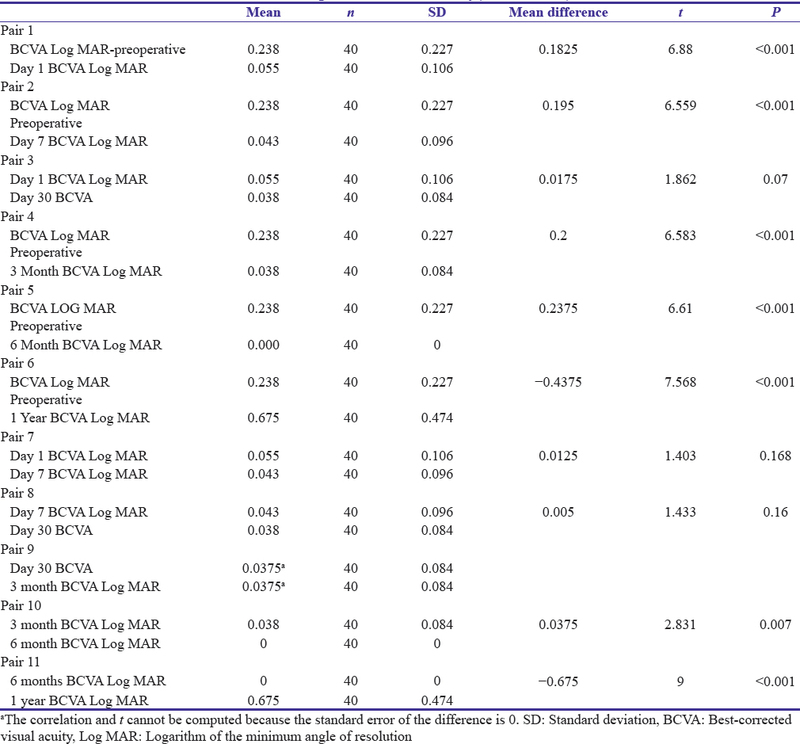 On statistical analysis (paired t-test), BCVA showed a P value <0.001 which is statistically significant [Table 4] and [Chart 4]. Mean operative time was 18 ± 2 min. Follow-up was done up to 1 year in 100% of patients. Postoperatively, the most common complication observed was subconjunctival hemorrhagic graft for day-1 (18, 45%) followed by one case each of dellen formation, graft contraction of 0.5 mm, and lost graft [Table 5]. Only one graft had persisting subconjunctival hemorrhage beyond 30 day (1, 2.5%). Resurgery was done in lost graft case after 1 month. In all cases, graft was indistinguishable by day 30 (40, 100%). There was no recurrence up to 1 year of follow-up. IOP was normal in all cases. No limbal stem cell deficiency and subsequent pseudopterygium were noticed in the superior site of the follow-up period. The modern concern of pterygium surgery is to avoid recurrences and complications while offering rapid recovery safely with minimal discomfort. A recently reported meta-analysis by Kaufman et al., indicated the superiority of CAG and LCAG over AMG, as well as the associated risk of vision-threatening complications with MMC. Other studies, although reported LCAG to have very few recurrence and complication rate, may even result in limbal stem cell deficiency of the donor site. Luanratanakorn et al., in their study, concluded that AMG has a significantly higher recurrence than free CAG. Further, it adds extra cost to surgery, its procurement is cumbersome, and requires surgical expertise. The risk of contamination is another problem as strict sterilization protocol to be maintained during its processing. CAG, AMG, or LCAG requires suture, fibrin glue, or autologous blood as an additional surgical adjunct to secure the graft in place. Suturing is more time-consuming, lead to higher postoperative discomfort, higher recurrence, and complications than others, such as prolonged healing, fibrosis, and granuloma formation. Fibrin glue, although have advantage of avoiding suture-related complication(s), it is not easily available everywhere and it is costly. Further, they carry the risk of transmission of prions and parvovirus B19. Recent reports on SFGF LCAG by different Indian authors such as Kurian et al., Singh et al., Choudhuri et al., and Sharma et al. are very encouraging and comparable with our present study. Whereas, studies conducted in the United Kingdom by de Wit et al. and Shaw et al. amazingly show no complication or recurrence at all. Our study had shown few graft-related complication(s) such as dellen formation [Figure 2], graft loss [Figure 3], subconjunctival hemorrhage [Figure 4], and graft contracture [Figure 5] but no recurrence. We have observed some amount of graft dehiscence from the host conjunctiva (up to 0.5 mm) which is common due to graft shrinkage or ocular movement. This is well-tolerated and does not need to be surgically addressed as long as the graft is secure in its place, and it heals up well. Mitra reported, “The main disadvantage of this surgical technique is the risk of graft loss in the immediate postoperative period, but once the graft stays in place for the first 24–48 h, it is going to stick around. As we all know that cause of pterygium is limbal stem cell deficiency, and it progress as subconjunctival fibrovascular mass; hence, the surgical technique was using LCAG of 8 mm to replace the stem cells along with subconjunctival resection of pterygium to prevent recurrence or slow the progress of pterygium even if it start reappearing. Average operative time in our study was 18 ± 2 min (standard deviation), which compares favorably with other studies as well, and definitely lesser than the suturing technique and possibly the extra time taken to prepare fibrin glue.,, We here emphasized on meticulous pterygium excision subconjunctivally, taking tenon-free slightly oversized graft, and waiting period of at least 3–5 min at the end of surgery for adequate adhesion which gives clue to the overall success as advocated by Mitra and Shaw et al. In this study, the subconjunctival hemorrhages persisted for 30 days followed by appearance of smooth, clear, and shiny graft. 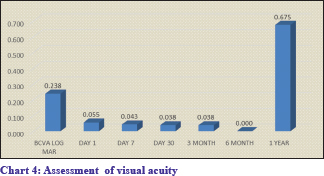 Graft became indistinguishable from adjacent conjunctiva by 6 months of follow-up [Figure 6]. (1) Limbal conjunctival autografting measuring 8 mm with subconjunctival resection of fibrovascular pterygium and cauterization of limbal base to destroy abnormal limbal cells is very effective in preventing recurrence. (2) Using patient's own blood as bio-adhesive is associated with less post operative discomfort, less post operative time and less complications. Di Girolamo N, Coroneo MT, Wakefield D. Active matrilysin (MMP-7) in human pterygia: Potential role in angiogenesis. Invest Ophthalmol Vis Sci 2001;42:1963-8. Kheirkhah A, Adelpour M, Nikdel M, Ghaffari R, Ghassemi H, Hashemi H, et al. Evaluation of conjunctival graft thickness after pterygium surgery by anterior segment optical coherence tomography. Curr Eye Res 2011;36:782-6. Hall RC, Logan AJ, Wells AP. Comparison of fibrin glue with sutures for pterygium excision surgery with conjunctival autografts. Clin Exp Ophthalmol 2009;37:584-9. Saw SM, Tan D. Pterygium: Prevalence, demography and risk factors. Ophthalmic Epidemiol 1999;6:219-28. Huerva V, March A, Martinez-Alonso M, Muniesa MJ, Sanchez C. Pterygium surgery by means of conjunctival autograft: Long term follow-up. Arq Bras Oftalmol 2012;75:251-5. Di Girolamo N, Chui J, Coroneo MT, Wakefield D. Pathogenesis of pterygia: Role of cytokines, growth factors, and matrix metalloproteinases. Prog Retin Eye Res 2004;23:195-228. Oldenburg JB, Garbus J, McDonnell JM, McDonnell PJ. Conjunctival pterygia. Mechanism of corneal topographic changes. Cornea 1990;9:200-4. Ang LP, Chua JL, Tan DT. Current concepts and techniques in pterygium treatment. Curr Opin Ophthalmol 2007;18:308-13. Foroutan A, Beigzadeh F, Ghaempanah J. Efficacy of auto logous fibrin glue for primary pterygium surgery with conjunctival autograft. Iran J Ophthalmol 2011;23:39-47. 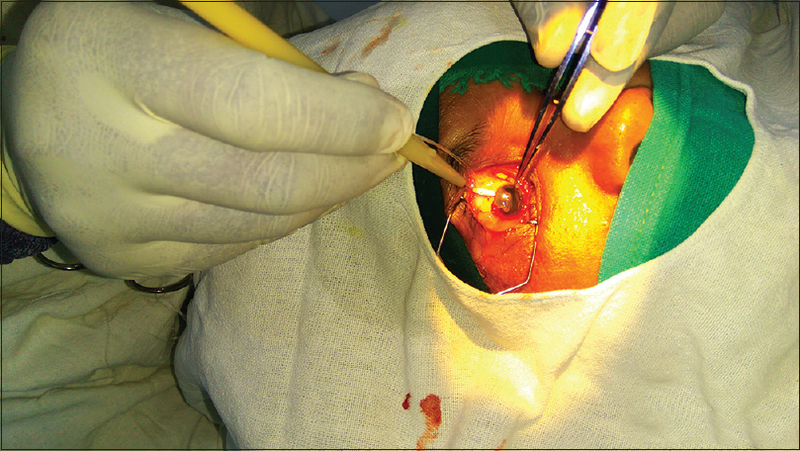 Ram A, Sudhir Babu P, Amaresh G. Comparative study of recurrence rate of pterygium excision with bare sclera technique and conjunctival auto graft in Nalgonda Dist. J Evol Med Dent Sci 2013;2:3025-30.
de Wit D, Athanasiadis I, Sharma A, Moore J. Sutureless and glue-free conjunctival autograft in pterygium surgery: A case series. Eye (Lond) 2010;24:1474-7. Koranyi G, Seregard S, Kopp ED. Cut and paste: A no suture, small incision approach to pterygium surgery. Br J Ophthalmol 2004;88:911-4. Zheng K, Cai J, Jhanji V, Chen H. Comparison of pterygium recurrence rates after limbal conjunctival autograft transplantation and other techniques: Meta-analysis. Cornea 2012;31:1422-7. Fernandes M, Sangwan VS, Bansal AK, Gangopadhyay N, Sridhar MS, Garg P, et al. Outcome of pterygium surgery: Analysis over 14 years. Eye (Lond) 2005;19:1182-90. Kaufman SC, Jacobs DS, Lee WB, Deng SX, Rosenblatt MI, Shtein RM, et al. Options and adjuvants in surgery for pterygium: A report by the american academy of ophthalmology. Ophthalmology 2013;120:201-8. Hirst LW. The treatment of pterygium. Surv Ophthalmol 2003;48:145-80. Luanratanakorn P, Ratanapakorn T, Suwan-Apichon O, Chuck RS. Randomised controlled study of conjunctival autograft versus amniotic membrane graft in pterygium excision. Br J Ophthalmol 2006;90:1476-80. Nakamura T, Inatomi T, Sekiyama E, Ang LP, Yokoi N, Kinoshita S, et al. Novel clinical application of sterilized, freeze-dried amniotic membrane to treat patients with pterygium. Acta Ophthalmol Scand 2006;84:401-5. Kurian A, Reghunadhan I, Nair KG. Autologous blood versus fibrin glue for conjunctival autograft adherence in sutureless pterygium surgery: A randomised controlled trial. Br J Ophthalmol 2015;99:464-70. Singh PK, Singh S, Vyas C, Singh M. Conjunctival autografting without fibrin glue or sutures for pterygium surgery. Cornea 2013;32:104-7. Choudhury S, Dutta J, Mukhopadhyay S, Basu R, Bera S, Savale S, et al. Comparison of autologous in situ blood coagulum versus sutures for conjunctival autografting after pterygium excision. Int Ophthalmol 2014;34:41-8. Shaw J, Hirst LW, Mitra S, Moore JE. New Approach Emerges for Pterygium Surgery. Eye Net Magazine. Cornea: American Academy of Ophthalmology 2011;31:34-8. Mitra S. Autoblood as Tissue Adhesive for Conjunctival Autograft Fixation in Pterygium Surgery. Orlando, FL: Poster Presented at the Annual Meeting of the American Academy of Ophthalmology; 2011. Sharma A, Raj H, Gupta A, Raina AV. Sutureless and glue-free versus sutures for limbal conjunctival autografting in primary pterygium surgery: A prospective comparative study. J Clin Diagn Res 2015;9:NC06-9.